1. Interest rates escalated rapidly (as a point, rates rise rapidly but drop slowly). The fact that they have now stabilized for the time being seems to be offering only a small amount of comfort to buyers. 2. Two years of price increases has made our fame as â€œone of the best bargains in the countryâ€ suddenly no longer true. The fact that our market is still below the hard cost of commodities (roofing, concrete, drywall, etc.) and below the inflation/appreciation trend line of the last 12 years seems, at the moment irrelevant to buyers. 3. Investors are dropping out of the market. Currently investors make up around 19% of the sales. This is the lowest percentage since June 2010. Even just a year ago the number was closer to 29%. 4. The economy, government shutdown, and threats of government debt defaults arenâ€™t exactly instilling confidence in the buying public. When the future seems uncertain, the emotions that run the financial markets can turn from greed to fear. It would seem that fear is dominating at the moment. So what will fix the demand problem? Well, usually price would be the answer to lowered demand. In this case, we are not expecting to see any major pricing drops. More likely than any significant pricing drops is that price appreciation is likely to come to a halt until the demand issues recover. What is the message to sellers? We are now in a balanced market. If you have been waiting for prices to peak or flatten before selling â€“ this is likely the time. A balanced market also means sellers may be required to be more flexible in contract negotiations, the days of multiple offers may become scarcer, and the choice of agent will matter more than ever. The message to buyers? Ease your fears. Rates and home prices are both still under market norms. Choices of homes are finally becoming abundant and that should be welcome news for choice starved buyers. How long will this last and what will 2014 bring? Whatever it is we will do our best to keep you posted on this ever changing market. What never changes for us is our deep gratitude to our clients who have allowed us to serve them this year and years past. We hope you have a joyful holiday season! Demand for homes has been a complete non-issue in the valley for the last 3 years â€“ so much so that the current drop in demand has come as a bit of a shock to anyone observing it. Supply has been beyond abundant through our recent distressed market.Â Banks were overwhelmed with the volume of short sales and foreclosures swamping them â€“ and unlike â€œnormal sellersâ€ the banks had to sell â€“ no matter the price.Â The number of listings on the market hit all-time new highs.Â In short, the only headline was supply, supply, supply.Â As the supply of homes surged, so did demand. Investors swarmed Phoenix to pick up bargain basement values that were everywhere. Tax credits lured the first time home buyers to the market. Net migration was up (i.e. more people moving in to the valley than were moving out). New builds were effectively at zero – meaning no new supply was being created. Â Sellers were swamped with multiple offers, many cash.Â It seemed like that party would never end. In the normal world, no market improves every month without a rest now and then. There are always changes going on, and we are way overdue for a cooling off. A move towards normality should not be regarded as a sign of impending doom, just a sign of impending normality. A move towards normality does not mean prices will come down. Unlike the stock market, prices almost never move downwards in a normal real estate market. Sellers only lower their price expectations when very desperate. Desperate times do occur a few times per century, but they are very rare. For a while in 2004 and 2005 we forgot that they could ever happen. Now the public knows all too well they do and consequently expects prices to drop at any moment, even when it is least likely to happen. Going forward, we should expect buyers to feel like they have the option to say no. More marketing and selling is going to be required to maintain the speed of the recovery. Without that, the recovery will probably slow and price increases will moderate. We are still in an early phase of a long term recovery, but right now home buyers will need much more convincing of that fact. 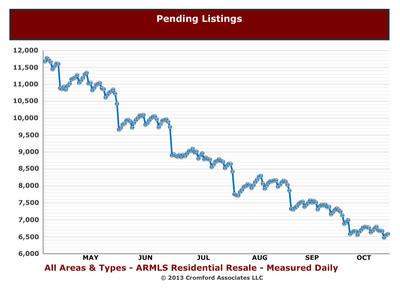 So far in September we have only 2,988 new listings added to ARMLS. That is the lowest number in 13 years. However 1,848 of those listings are priced between $150,000 and $500,000. That is the largest number for this period since 2009 and it is 29% more than last year. Between $250,000 and $500,000 we have the most new listings during this early part of September since 2008. So supply is growing in the mid-range and in contrast the low-end under $150,000 has seen new listings drop by 40%. I’m sure a lot of buyers wish there were more homes available under $150,000. Above that mark buyers now have a lot more choice, but can they afford them? What does this mean for home sellers?Â If the trend towards normalcy continues, we can expect fewer offers, slower price appreciation, and more competition for buyers.Â Sellers, who have been waiting for price appreciation to peak, might consider if that time is approaching.Â Buyers who are waiting for lower rates and price drops, are likely to be disappointed and should get off the sidelines. Doesnâ€™t â€œnormalâ€ sound like a place we all want to be?Â As always, we will strive to keep you apprised of the ever changing market. You are thinking of buying a home – but not sure if now is the â€œright timeâ€.Â If you are waiting for the perfect time â€“ it was May of 2011. It isnâ€™t coming back.Â I fully understand that numerous national experts are blathering on about a â€œbubbleâ€ and the big problems that will result from all of the institutional investor owned homes in thePhoenixarea.Â All of the people spewing this nonsense (even the ones wearing suits and who have a doctorate degree) have one thing in common: they have no actual grasp of the market and arenâ€™t really very good at counting either.Â Donâ€™t rely on them to guide you on the decision to buy.Â Did any of them tell you to buy back in May of 2011?Â Nope. Arizonaprices would need to rise another 48% to make a new all time high.Â Foreclosures here (a meaningful LEADING indicator) are already below normal.Â Short sales are falling fast.Â The rate at which prices are rising is slowing as the market returns to normal.Â Interest rates are no longer at record lows but still much lower than the average mortgage interest rate (8.6%) for the past 40 years.Â A year or two from now, people who wait will say I should have bought back in the last quarter of 2013.